On the checkout you will be able to find a shipping price for your country/region. If your country/region is not listed, please contact us, we do ship everywhere, its just that for some countries the price is size and weight sensitive. If you only order a small item, our shipping prices might not be correct, please send us an email. We ship Internationally, please contact us for a quote! For more detailed deliver policy see the following document. Prices: We ship with Schenker within Europe (Switzerland and Norway included with extra export fee.) but also Internationally! 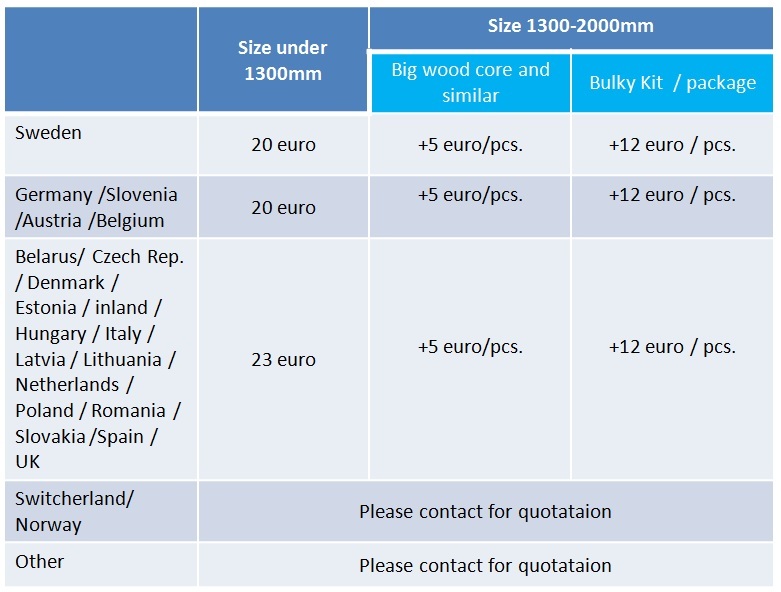 Price is set to 23 euro for all packages up to 1300mm long in EU. To Germany/Slovenia/Austria/Belgium it is 20 euro. Sweden at 17 euro. Above 1300mm there is a charge. Timing: Normally we dispatch the goods from our warehouse after 1-3 working days. If the goods are not in our warehouse, delivery times may be longer, and you will be informed. Transit time is 2-4 days within Europe. It means you should get your goods 5-7 working days after order. Some non EU countries (Norway) require us to put in your Personal number in your country in the invoice and export paperwork! A bulky package is considered over 1300mm and there is approximately 10-15 euro extra charge, please contact us if in doubt. For larger orders/bulk orders please contact us as the shipping estimate on the web page might be off. Bulky items are defined by shipping companies over 1300mm maximum length. There is an added cost to the shipping (~10-15 euro). Please consider the shipping cost not only includes transportation but also handling, which means packaging the goods, cutting the goods, sorting and other similar time and resource consuming expenses. PS: Small items such as samples, inserts, VDS or rolled edges, that can be fitted in an envelope can typically be shipped to Europe for ~10-15 euro depending on the weight. Please contact us for more info or any question.